PRISTINA, Kosovo (AP) — Tensions in Kosovo rose again Friday after police arrested three ethnic Serbs, including two police officers, on suspicion of involvement in the killing earlier this year of a leading Serb politician in the north of the country. The three men were arrested in the Serb-dominated town of Mitrovica, 40 kilometers (25 miles) north of the capital, Pristina, as suspects in the January slaying of Oliver Ivanovic, police said in a statement. A fourth Serb was arrested for resisting police. A fifth person is still at large, police said. Police said they seized evidence for the investigation into Ivanovic’s killing during raids in four locations. Police showed photos of a drone, automatic weapons and ammunition and other equipment found in the raids. Prosecutor Syle Hoxha said they have questioned more than 40 witnesses to date in the case. Nobody has yet been charged in the slaying. Thousands of Serbs protested in Kosovo towns, some blocking all main roads leading to Northern Mitrovica, as well as several border posts with Serbia. No violence was immediately reported. Kosovo’s ethnic Albanians fought a bloody war with Serbia from 1998-1999 which ended with a 78-day NATO air campaign in June 1999. Kosovo declared independence from Serbia in 2008 which Belgrade still refuses to recognize. 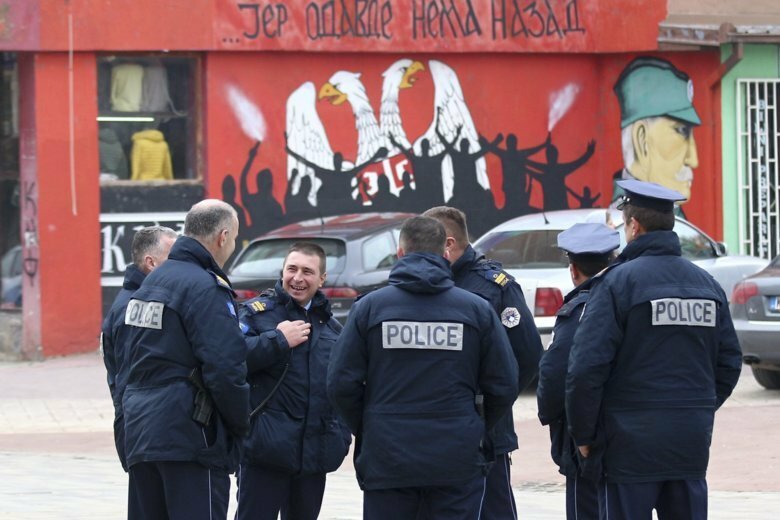 Earlier this week, tensions soared after Kosovo failed to become a member of the international police organization, Interpol, following intense lobbying by Serbia. Kosovo slapped a 100 percent tax on goods imported from Serbia in apparent retaliation. In Belgrade, Serbia President Aleksandar Vucic said the arrests were a “demonstration of force” that he said was designed to frighten the Serbs in Kosovo and avert attention from the taxes that Kosovo imposed in violation of a regional trade agreement. Vucic spoke after a meeting with the members of the Serbian government. He held meetings earlier on Friday with security officials and the ambassadors or Russia and China, Serbia’s allies in its refusal to recognize Kosovo’s independence. Kosovo Prime Minister Ramush Haradinaj’s Cabinet appealed for calm and said the police operation was not linked to any political development. Haradinaj met with ambassadors of Western powers including the United States, Britain, Germany, and France, for talks on the country’s situation and to explain the tax on Serb and Bosnian goods. Ethnic Serb leaders in Kosovo also called for calm and asked Serbia and the international community to assist them. Goran Rakic, mayor of Northern Mitrovica, told The Associated Press that ethnic Serb leaders had formed a crisis center and called on the international community and Serbia for help. He said he had talked by phone with Vucic. Vucic’s adviser Nikola Selakovic said the arrests of four Serbs in Kosovo were designed to “spread fear, intimidate and demonstrate force” against the Serbs in Kosovo. “This is a game of nerves, a walk on thin line. The goal is to provoke our reaction which would be immediately used for measures against us,” Selakovic said. Llazar Semini reported from Tirana, Albania. Dusan Stojanovic and Jovana Gec contributed from Belgrade, Serbia. Bojan Slavkovic contributed from Northern Mitrovica.